William Powers is awash in addictive behavior regarding "screens" (as he calls them) on his computer, his phone, and all techie things in his life. Resolving to find balance, he and his family institute an internet sabbath that begins Friday night and ends Monday morning. Their struggles indicate withdrawals from an addiction, but they eventually find a better balance by not being chained to their "screens".The problem or discussion is not a new one, and unfortunately I feel that Powers pushes some of his analogies a little too far for them to be really swallowed. 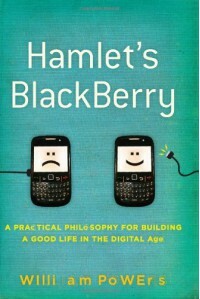 Hamlet's blackberry is a case in point. In the play "Hamlet", Hamlet the character talks about "the table of my memory" and the tables referred to are of the erasable type that were used in Shakespeare's day to write something down on, then erase it, and write again. Kind of a writable etch-a-sketch. See http://wynkendeworde.blogspot.com/2008/07/hamlets-tables.html for an excellent overview of Hamlet's erasable "tables".Hamlet's tables were not really the equivalent of a blackberry, but perhaps were more the equivalent of a moleskine journaling notebook.There are some worthwhile moments in the book, and I appreciated Powers solution to turn things off and develop some space away from being totally electronically connected. But overall, I felt the book was a bit of a stretch that all of his discussions of prior technologies (the printing press, for one) would result in a similar resolution for today's technologies.